Conditioning leather is the most important step in preserving leather. Leather naturally has proteins and lubrication between its fibers. The well being of these proteins and lubricants are essential to the beauty, strength and flexibility of the leather. Overtime these natural elements in the leather will fade and you will need to condition your leather to ensure the long term care of your leather. Apply the Lexol Leather Conditioner and you will provide your leather with natural properties it needs to stay looking healthy and new. LEXOL protects old and new leather from cracking and premature aging by providing the lubrication necessary to keep it strong and supple. It is made with the finest tanning oils which are emulsified into microscopic droplets. These oil droplets bond to the leather fibers, nourishing the leather and leaving no greasy residue. Use LEXOL regularly to keep your leather looking and performing its best. Step 1: THE TYPE OF CONDITION OF ANY LEATHER CAN CREATE VARYING RESULTS UPON EACH APPLICATION. ALWAYS TEST LEXOL ON A SMALL HIDDEN AREA BEFORE EACH USE. Step 2: Shake well. 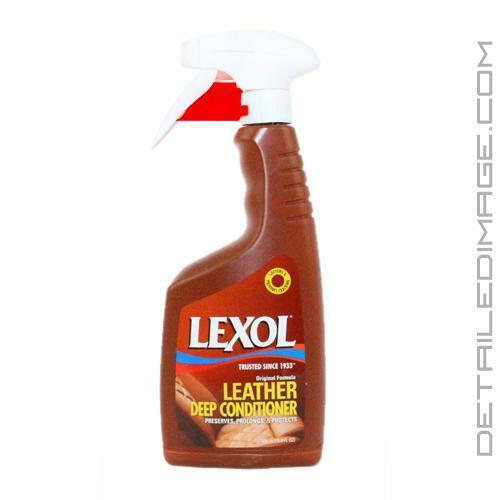 If leather is dirt, clean it first with LEXOL-pH Leather Cleaner. Apply 1 or 2 sprays of conditioner to clean cloth or sponge. Step 3: Apply conditioner over entire cleaned surface. Step 4: After a few minutes, wipe off excess and buff with a clean cloth. does a great job keeping newer leather looking new. I bought this for my 2011 CTSV which was already in great condition, don't think this is the product for bringing older leather back to life, but for my purpose it was perfect. non greasy which is a plus. I also used the lexol cleaner before conditioning. Great product. Doesn't leave the leather feeling greasy or shiny. Recommended. Best stuff ever! Never used such a good product!